There are 3 swing states- Virginia, Missouri, and Wisconsin- that we polled around Thanksgiving and have now polled again in the last couple weeks. Barack Obama is in a stronger position across those states now than he was in late fall against all four of his top Republican opponents. Against Mike Huckabee and Newt Gingrich Obama's gains have been modest. He led Huckabee by an average of 1 point in those states before, now he leads by an average of 3. He led Gingrich by an average of 6 points in those states before, now he leads by an average of 8. The gains against Mitt Romney- and especially Sarah Palin- are more substantial. 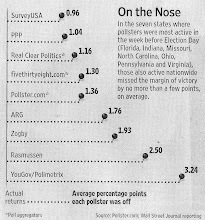 Obama led Romney by an average of just 1 point in those states in our first polls but now leads by an average of 5. And he led Palin by an average of 9 points on the first round but now has a 14 point edge. Why is Obama doing better? It's actually not because he's become more popular. His average approval rating in the three states was 47% in late November/early December and now it's...still 47%. It has more to do with the unpopularity of the Republicans. Huckabee's average favorability in the three states is 40/38, but Romney's is 32/44, Gingrich's is 29/52, and Palin's is 33/60. The top potential names in the GOP field remain exceptionally weak. We've been saying for months that there's time for someone more compelling on the GOP side to emerge, or that one of these folks could rehabilitate their image. But there's no sign of either of those things happening so far and the clock's ticking. Obama's greatest asset as he vies for reelection is the Republican candidate field. Obama's clearly making at least some modest progress in the states that will determine next year's election. And this data is just more evidence that Palin is even weaker compared to the rest of the GOP field than she was last year. I didn't think Palin could get anymore unpopular. She has no future in politics. And I don't think Huckabee is actually going to run... nor Palin. This disturbs me somewhat because it opens the door more for some other Republican who may be more electable... but it also opens up the chance for Newt Gingrich to win the nomination (as the anti-Romney vote has nowhere else to go) and that would be pretty sweet. Gingrich would get destroyed by Obama. Not related specifically to this comment, but I was wondering the next time you did a national/Iowa/NH poll, you might poll the Republican primary in a different format to test viability of the 'dark horse' candidates. "Candidate J is a four-term Congressman from a swing state in the Midwest. Candidate J is best known of being an outspoken critic of illegal immigration. He has also been highly critical of the Bush administration's guest worker plan. Before coming to Congress, Candidate J was a Department of Education official under Reagan and George H.W. Bush and was president of a conservative think tank." The idea is that you read brief descriptions of each candidate without mentioning their name and ask how much they would consider voting for that person - so the results tell you which candidates might be really viable, since the Republican frontrunners are relatively weak. Could you please poll Michigan soon next? Specifically, poll Snyder approval, thoughts on his budget plan and his methods, support or lack thereof for recall, and whether they felt that he was governing with the platform he campaigned on. We try to avoid big paragraphs like that with automated polling. Harder to keep people's attentions. It's a valid idea, and something campaigns themselves do exhaustively. Another negative to the idea is that campaigns are not necessarily won or lost on qualities on paper. It's a lot about personality and, frankly, looks. You will, however, see something about candidate qualities in a briefer form when we release our national primary results tomorrow.